OUR MUST HAVE EYE AWAKENING MIRACLE PRODUCTS: BECAUSE WE KNOW HOW MUCH WE NEED THEM!!! As the skin around the eyes is the first place on your face to show age, a late night, or inflammation of any sort, we decided to search for the best miracle miracle products, to give us the illusion of a full 8 hours of sleep night! Hold on, eye cream won’t permanently lift, brighten, de-puff, or smooth wrinkles… but it will at least create the “awakened” look we all need for a bit!Personal tip, never apply any eye products in the evening. The skin around the eyes is extremely thin, and applying any cream in the evening will just make them look more puff in the morning. Made up of a billion microcapsules of oil dispersed in Rose de Mai Water, Chantecaille’s ‘Eye Lift’ quickly and effectively reduces puffiness and fatigue, while smoothing out wrinkles and fine lines. We love how the ceramic tip of the pen applicator has a cooling, awakening effect. Estelle & Thild’s cooling gel is packed with organic ingredients and vitamins to revive the delicate area around your eyes. Ideal for sensitive complexions, it sinks in quickly to reduce puffiness and lighten dark circles. The soothing blend of Aloe and Licorice Root work to brighten and refresh dehydrated skin. The experts at Anne Semonin believe innovative cryotherapy facial treatments are an effective way to depuff and tighten skin – these skincare ice cubes “lessen the effects of eating too much salt or a night of drinking a few too many mojitos.” Formulated to effectively treat discoloration, puffiness and wrinkles, this set of six is infused with hydrating Marine Spring Water, plumping Hyaluronic Acid and soothing Gourd Extract. When it comes to a fresh face, a little goes a long way. Embryolisse’s ‘Eclat Du Regard’ treatment comes in a petite stick formulation that invigorates and hydrates the sensitive area around your eyes. Active botanical elements like Aloe Vera and natural Sugars work to moisturize and smooth texture, while circulation-stimulating Metabiotics help to reduce dark circles and puffiness – it’s the easiest way to achieve a more youthful appearance. These eye masks are incredibly potent: They revive and lift your whole eye area in a matter of 10 minutes. Made with an algae biomatrix of antioxidants and nutrients to reduce fine lines and wrinkles, they leave the delicate skin around the eye area visibly refreshed, brightened, and smoothed. This one comes in a single-use pack. This miracle under-eye elixir is actually an oil that sinks right into the delicate under-eye area and immediately starts to work, reducing inflammation and smoothing fine lines, and brightening for a plumped, healthy glow. Made with skin-perfecting fatty acids and soothing, anti-aging essential oils (argan, jojoba, olive, camellia, rosehip, pomegranate, evening primrose, chia seed, ylang ylang, and rose geranium among them), it comes in a rollerball that cools the skin to further reduce puffiness, feels incredible, and fits easily in a back pocket or makeup bag—genius. This delicate, water-based miracle-worker is spiked with plant-based hyaluronic acid and a complex of antiaging natural oils. 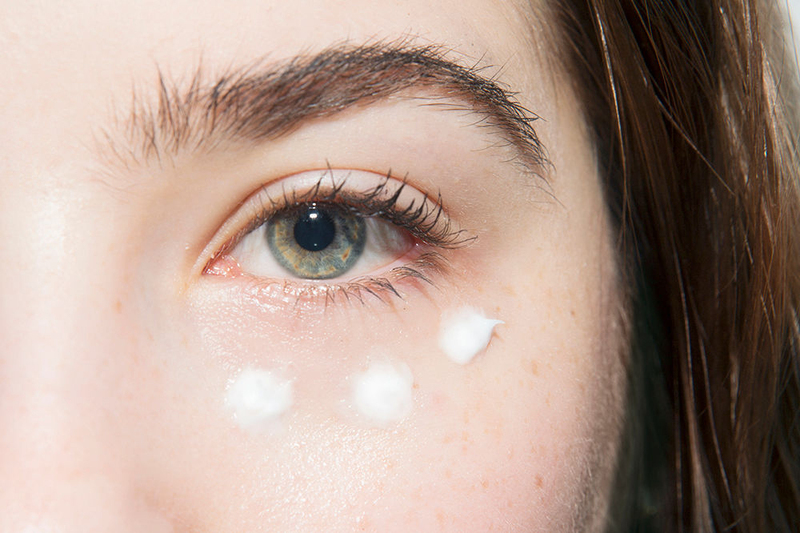 It fights puffiness, dark circles and fine lines—plus it’s great under makeup.